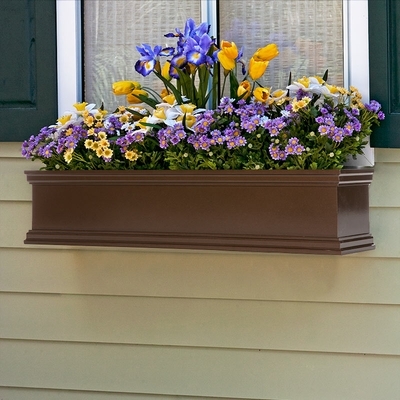 Whether your home is high class and modern, or old world and rustic, this Latham window box planter is sure to make an impression. It mounts easily to any window, railing, or wall to display your favorite flowers, vines, or edibles. Unlike many planters, these are made from fiberglass, allowing them to withstand harsh weather conditions with ease. You'll notice no warping or rotting, and the planter will maintain its high performance in sun or summer storms. Drainage holes in the bottom prevent over watering and rain water damage. You can also add the self-watering system to deliver fresh water to your plants consistently, even when you don't have time to water them yourself. Go on vacation and come home to flowers that are still vibrant and well-nourished. Choose from additional colors and sizes, and add your choice of brackets for installation anywhere you need it. Includes stainless steel brackets and integrated cleat-mounting system for easy installation on walls and fences. Allow 2-3 weeks for lead time as this color requires a deluxe 2 part painting process.